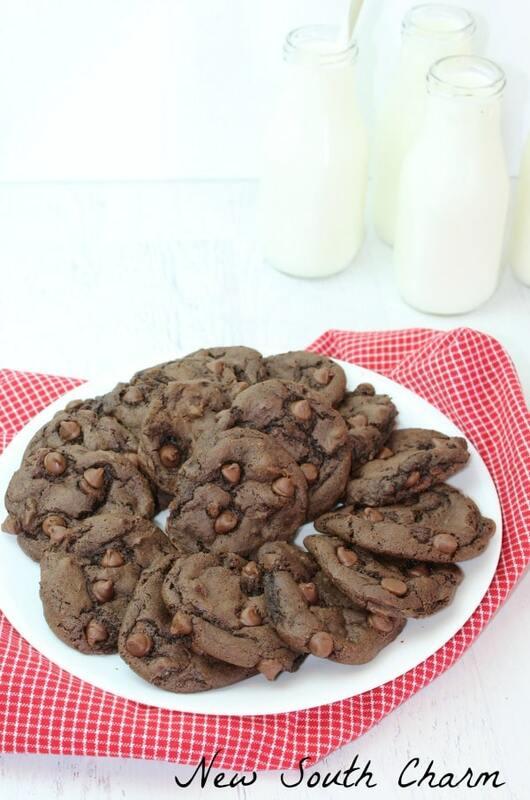 These Triple Chocolate Chip Cake Mix Cookies are just a perfect little piece of chocolate perfection. 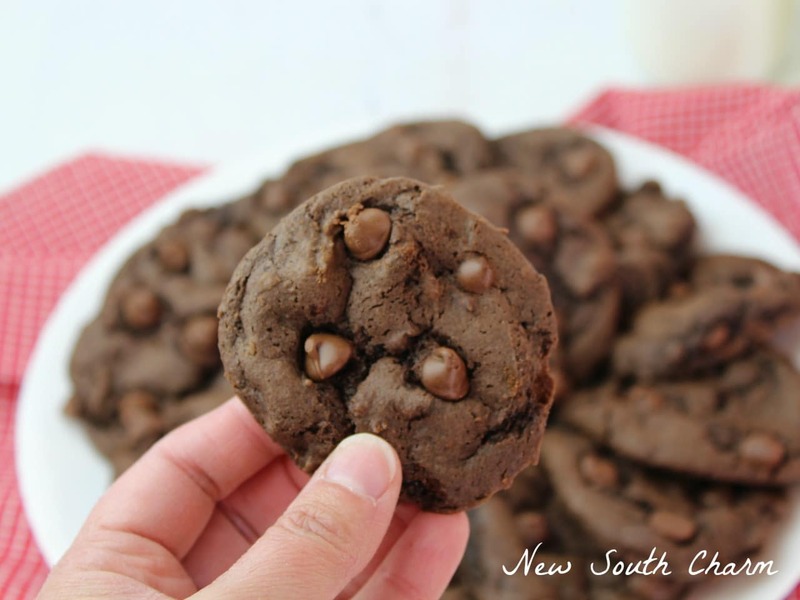 Easy and delicious these cookies are perfect for parties, gifts, bake sales or just filling your cookie jar. Some times a girl’s just have to have chocolate. Chocolate is the ultimate home remedy. It’s the cure for a broken heart. It can take the edge off a stressful day and it is always the perfect ending to an incredible meal. That’s enough prose about chocolate let’s talk about these cookies and the little trick that makes baking them super easy. These cookies are made from a store bought cake mix. Baking is not my strong suit. Give me a recipe for just about any entree and I can make it without breaking a sweat. Baking though makes me a nervous wreck. That’s why when I do bake a cake or cookies the recipe is always super easy and there’s usually a big shortcut like a mix or store bought dough. 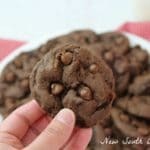 To make these cookies you’ll need one box of Triple Chocolate Fudge Cake Mix, two eggs, 1/2 cup vegetable oil, and chocolate chips. Then combine all the ingredients in a bowl and mix throughly. When the dough is cooled use a cookie scoop to portion out the cookies onto a greased cookie sheet. Then pop it into a 350º oven for 12-15 minutes. Transfer cookies from the oven to a cooling rack for a few minutes then enjoy. In a bowl mix together all the ingredients either by hand or with a mixer on low. The dough will be very thick. Cover the bowl with plastic wrap and place in the refrigerator for an hour. Once dough is cooled use a cookie scoop to portion the it out on a greased cookie sheet. Give me all the chocolate! These look delicious and definitely easy enough. Yum! Thanks Carlee! They were so, so, so good! Oh my goodness, these are yummy looking. 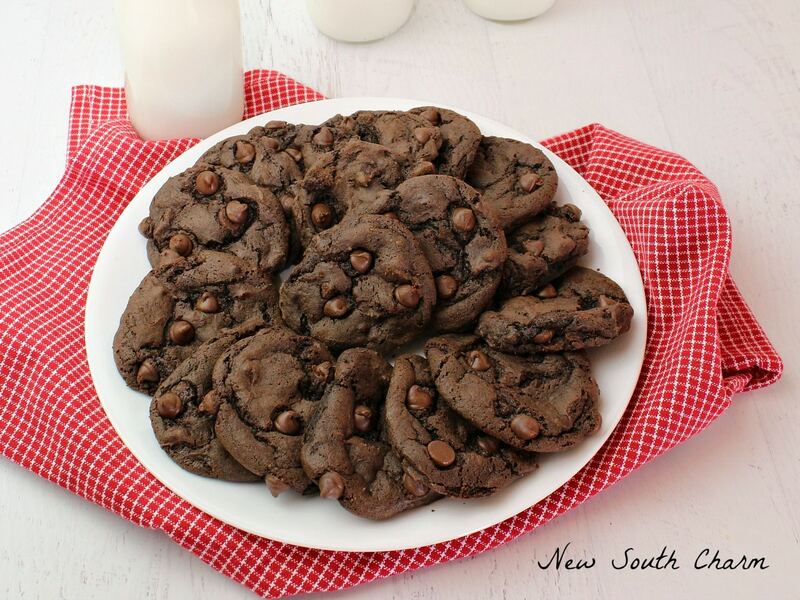 I love chocolate and these are so easy to make. Thank you for sharing at Dishing it and Digging it link party. Susanne, these cookies look so good. I love the video. Thank you for sharing. I’ve scheduled a share for these cookies. Making them now! Can’t wait to eat! !